I remember these blue-colored buses all around the Metropolis in the '80's and early '90's. They were called the "Love Bus". These buses had hearts painted all around the bus with simple phrases. During their time, they were popular cause aside from the "love bus" branding, they were air-conditioned. This was popular at a time when majority of the buses lacked the luxury of cool airconditioning. I remember riding one a long time ago and I was seated beside a "crush" of mine. How very apt we sat together inside the Love Bus. These buses seemed to have been phased out or simply decommissioned in favor or newer buses. 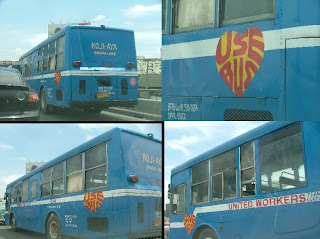 Yesterday, I saw one which looked very much like the original Love Bus with some paint job and modification. The hearts were still there but the heart had the words "Use Bus". That was kinda weird if you're familiar with the Love Bus. I wonder if it's because it's very used ? The bus had a "United Workers" label on it and seemed like it was scaled down from public transport to a company bus. So this post pays tribute to the memory of those buses popularly known as "The Love Bus". I used to love the love bus simply because i found the hearts and color-scheme cute. :p that was ages ago, though, hehehe. We also have what we call the "killer bus". The one with wooden planks as seats, no aircon, no doors and a driver that zigzags through EDSA as if he's king of the road. Wala lang. Just dropping by! Lazer extreme uli tayo minsan!